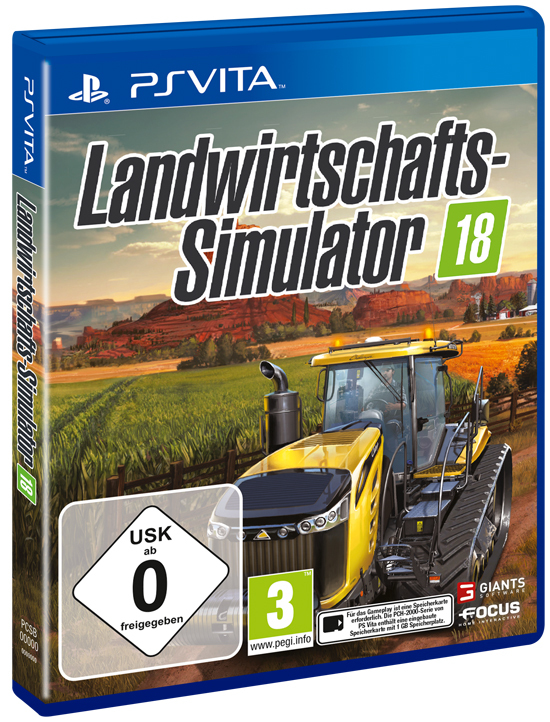 Farming Simulator 18 welcomes you once again aboard the largest handheld farming simulation series ever! Already enticing millions of players on PC and consoles, Farming Simulator returns to Nintendo 3DS and PlayStation Vita with Farming Simulator 18, now available in retail stores and for download. The launch trailer, get a first taste of its new features for virtual farmers, who can enjoy harvesting their fields from the palms of their hands! Become a modern farmer in Farming Simulator 18! Immerse yourself in a new, engaging Southern US environment, harvesting wheat, canola, corn, sugarbeet, potatoes and, for the first time, sunflowers. Take care of your livestock with new animals to breed and transport, as pigs are now joining the indispensable sheep and cows! Also try your hand at forestry – an activity new to the Nintendo 3DS version. Sell your products on a dynamic market, then use the profits to expand your farm. As your career progresses, gain access to a huge selection of over 50 farming vehicles and machines. These are faithfully recreated from over 30 of the biggest names in the industry, including, for the first time, some of AGCO’s most respected brands: Challenger, Fendt, Massey Ferguson and Valtra. Farming Simulator 18 is now available on Nintendo 3DS and PlayStation Vita system at retail, and for download on the Nintendo eShop and PlayStation Store. - Expand your farm through tons of varied activities: plant, harvest, take part in forestry activities, all with their dedicated machines. - Breed and transport animals: cows, sheep, and for the first time, pigs. - Develop your farm in a new and immersive American environment. - Use and drive over 50 faithfully reproduced farming vehicles and tools, including AGCO’s most respected brands: Challenger, Fendt, Massey Ferguson and Valtra. - Grow and harvest new crops such as sunflowers, in addition to sugar beet, potatoes, wheat, canola and corn.